Occasional Features: Magazine Madness and/or Mania: Vintage Teen magazines and related ephemera and Movie Madness and/or Mania: Lost Teenpic Classics. Imaginary Summer Book Club Featuring Lost Classics of Women’s Literature: four titles featured irregularly from July through October. Hi there! I am looking for a title of a book I read in the 4th grade. The book was something I found in my grandmother’s closet. 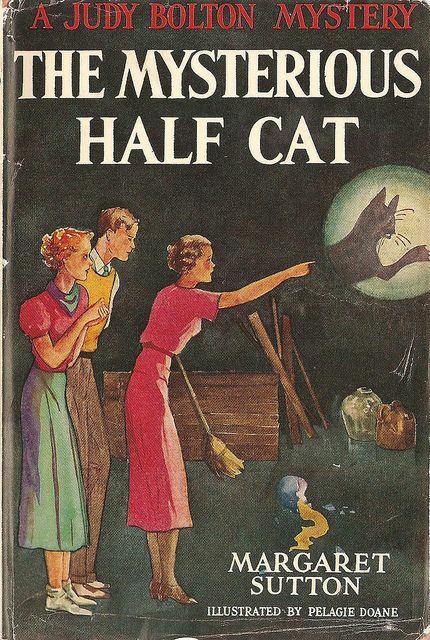 It was an old book at the time about a teenage girl sleuth who was trying to solve a mystery related to a cat’s shadow that appeared in two halves. Sound familiar? I would like to know who the author was and if there are other books. Thanks for your help! Hi Amy! Thanks for writing- unfortunately the description doesn’t ring any bells for me, but it sounds like a really interesting book. Two places where you could ask about it are on the Shelf Discovery Facebook page, where they occasionally run a feature called “Plot Finder” to answer questions just like this- they are usually very successful! Where can I find earlier posts? I would love to read your thoughts on the well of loneliness. Thank you! Hi Jessica! I actually do work with middle-school students, but my background is in Media Studies (film & TV), and I’ve always been interested in mid-20th century pop culture, so both of those aspects got parlayed into this blog as well as just being a book lover! Just stumbled across this site and can already tell I’ll be spending hours here, and lots of $ on new “old” books to read. I’ve been hooked on this genre since my mom shared with me her collection of books from her youth back before I was I teen myself, and it looks like you touch on all my favorites. From Trixie Belden to Beverly Cleary, Maureen Daly and Rosamond du Jardin, I grew up with them, loved and laughed and cried right along with them. I’ve re-read them all so many times I’ve had to start downloading them on my kindle to preserve the books my mom gave me, some of which are original hardcover. I’ve just started browsing your blog, and I look forward to reading some unfamiliar titles and rediscovering some that I’ve read but long forgotten. I was never much into Nancy Drew, but loved a series about a teenage sleuth with an identical cousin. Can’t for the life of me remember the names or the author. If you know of them, I’d appreciate the info. Anyway, so glad I found your site, and a kindred spirit! Hi Michelle, thanks for you comments! So happy to hear you’re enjoying it! I had a book I treasured when I was about 10 years old. All I could remember was that the cover was pale blue and the girl in the story lived in Carmel, CA. A couple of months ago, I went to an estate sale and found it! Unbelievable! It’s called “Milestone Summer” by Nicolete Meredith. (It’s not as good as I remembered, but I’m not 10 anymore, either).